Delivers over 24g* of rapidly absorbed carbohydrate per serve for improved performance and recovery. Fructose free for better digestibility and gastrointestinal tolerance. Panax ginseng supports oxygen uptake and breathing capacity. Activity lasting longer than 45 minutes begins to diminish glycogen stores and the body relies more heavily on blood glucose to provide the fuel required to keep you going. Ingesting a rapidly absorbed carbohydrate fuel is important to provide a fuel supply for active muscles. Each 35mL Energy Gel delivers a carbohydrate blend of glucose and maltodextrin (over 24g* for Mocha and over 25g* for Tropical). Coenzyme Q10 helps protect from free radicals that are generated during exercise. Athletes have a higher metabolic requirement for CoQ10. Numerous studies of Panax ginseng have shown results in improvements in endurance, heart rate, oxygen uptake and breathing capacity. Caffeine (in Mocha flavour only) works on the adenosine neuromodulatory system in the brain, a system heavily involved in pain processing. 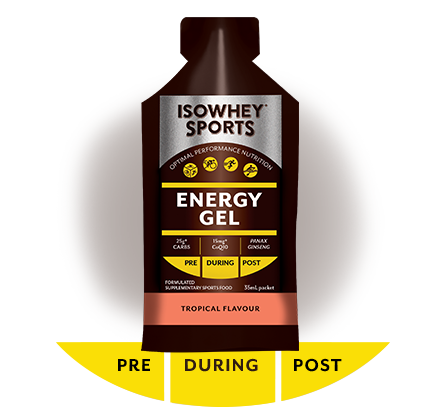 1 serving (35ml) IsoWhey Sports Energy Gel 15 mins prior to exercise, and then 1 serve every 30 minutes. Purified water, maltodextrin, glucose, tropical flavour natural, lemon flavour natural, citric acid anhydrous, guar gum, xanthan gum, sodium chloride, potassium phosphate, potassium sorbate, Panax ginseng, sodium propionate, ubidecarenone (Coenzyme Q10). Not to be used as a sole source of nutrition. Should be used in conjunction with a balanced diet and appropriate exercise program. Contains caffeine. Not suitable for children under 15 years of age or pregnant & lactating women. Not suitable for individuals sensitive to caffeine. Should only be used under medical or dietetic supervision.